A reflection for the 13th Sunday in Ordinary Time, Year B. The readings are, Wisdom 1:13-15, 2:23-24; Psalm 30; 2 Corinthians 8:7, 9, 13-15 and Mark 5:21-43. God did not make death. That’s what I kept thinking last Saturday. You see, I was in Poland and last Saturday I had the chance to spend the day at the memorial at the Auschwitz-Birkenau extermination camps. All I kept thinking was, “God did not make death.” But there was a lot of death at Auschwitz. Between 1940 and 1945, some 1.2 million men, women and children were brought by the Nazis to the extermination camps of Auschwitz and Birkenau in Nazi-occupied Poland. Of these, 90% were killed and of those who were killed, about 90% were Jews. People would be brought to Auschwitz in box train cars (for cattle). When they arrived, they would be forced off the trains and separated by gender: men to one side and women to the other. Then they would be separated again: Those who were deemed suitable for work and those not suitable for work. If you were found not suitable for work, you would be sent directly to the gas chamber. 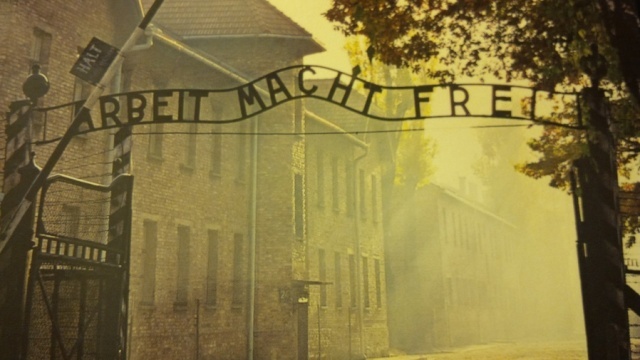 75% of the people who arrived in Auschwitz never stayed there; they went straight from the train into the gas chamber. Among them, a Jewish woman converted to Catholicism by the name of Edith Stein and her sister Rosa. Edith Stein was a Carmelite Sister and is now known as St. Teresa Benedicta of Cross. Of the 25% who were found suitable for work, the average stay was 3 months. The number one cause of death (besides gassing) was starvation. I don’t have to tell you the cruelty, horror and inhumanity that went on at Auschwitz and other camps. I don’t need to tell you all the horrible inhumanity and suffering that still goes on every day in the Middle East, because of ISIS and Joseph Kony in Uganda and so many other places – because of human cruelty. Because of sin. But God is not the author of death. There was a lot of death at Auschwitz, but God did not make death. That is why Jesus consistently fought against sickness and death. I used to think that it’s not possible that Jesus healed everyone he met. We only hear those stories in the Gospels, but Jesus didn’t heal everyone. I don’t think that anymore. We only hear stories of people being healed in the Gospels because Jesus healed everyone! Everyone who comes to Jesus and touches the hem of his garment or pleads to him for their sick child receives a healing. Everyone who meets Jesus is healed. But it’s not always easy to see the healing and not everyone gets healed physically. That’s because God in his wisdom and awesome majesty is working to get us to Heaven. This life is but a rest stop; we are but pilgrims on a journey. God is healing us so that we can have eternal life. We believe that death is a consequence of sin, but our Faith also teaches that death is a solution to sin – because once we die to this life and we are finally home with the Father, we will sin no more. That’s our faith. Still, walking through Auschwitz last Saturday, it was hard not to question faith. Nazi extermination camps didn’t just kill 6 million Jews; they also killed some 7 million non-Jews, including two million Polish Catholics, some three million Soviet Prisoners of war; over 1 million Gipsies, 200,000 people with disabilities and thousands of people from other ethnic and religious minorities including thousands of Catholic priests and religious. What’s worse is that for many, places like Auschwitz killed God, because it killed their faith. Walking through Auschwitz today is hard not to wonder where God was. God did not make death. God is the God who takes on our suffering. Where was God at Auschwitz? He was on the train, herded like cattle. He was there holding the hand of a little girl as they were taken together into the extermination chamber. Where was God? He was on the Cross. God did not make death. God is the God who takes our sickness and our death. He dies so that death can be no more. St. Paul tells us that death has no victory (1 Cor 15:55) and that the last enemy to be destroyed is death (1 Cor 15:26). Well, the battle has been won. Death is no more. Jesus Christ has destroyed death, #lovewins. God is not the author of death. God is the author of life. God is present in every moment of life. Where was God at Auschwitz? He was there in the small acts of kindness; the encouraging smile; the strengthening word. He was there in that small piece of smuggled dried bread so that someone could eat. God was present in every heroic act of love, the least of which was the final act of St. Maximilian Kolbe who offered to take the place of a man, a stranger, condemned to death by starvation, so he could have the opportunity to, one day go home and be with his wife and children. St. Maximilian Kolbe gave his life and that man did survive and went home to his wife and children. God is not the author of death. God is the author of life and we too are called to be authors of life. In everything we do and say, we must always give life. To everyone we meet we are to say, “talitha koum,” little girl, arise! We come to Mass here to receive the Author of Life in the Eucharist so we can go out there and give life to others. At the end of the day when you do your Examen, ask yourself two questions: “Who did I give life to today?” and “how did I give life today?” We are called to give life in everything we say and do; St. Paul tells the Corinthians that if they can, they should support the Church in Jerusalem (2 Cor 8); that’s a way to give life. Last week Pope Francis released an encyclical, Laudato Si, on the care of our common home; it’s about caring for creation. It’s about giving life. Not just about trees and whales or protecting lakes and the ozone layer, although that is important. Laudato Si is about respecting all creation. That means defending and protecting all human life from conception to natural death. It means defending and protecting marriage and family. It means working for social justice and for the dignity of all workers; for the poor and those in the peripheries. We are called to work for life because God is the God of life. This is not our home because there is death in this life and we belong with God who did not make death. Our home is with God, the Author of Life. Why do you not mention that at the time of the deportations that Poland was under German occupation? By failing to mention this you imply that Poland was an ally of Germany and complicit in the Holocaust. Also today Auschwitz-Birkenau is not a concentration camp, it is a memorial museum as reflected in its title – Auschwitz-Birkenau Memorial and Museum, therefore you visited a museum which once was a concentration camp in German occupied Poland. I would say – from the geographical point of view – it’s true, NOW this is in Poland. From the point of view of historical truth and morality – that’s not true. Then there NO POLAND during WWII, Poland was under the occupation of Nazi Germany and they were murdering innocent people. For me personally, writing such way (camps in Poland) it like helping the Germans. As a result, they do not have to feel responsible for this crime. This transfer also THE RESPONSIBILITY from Germany to Poland. Izabela and Stan – thanks for your comments. I did hear very similar comments from other Polish people. Thanks for bringing it up. In no way did I mean to imply that the camps were Polish. Most people I know are fully aware that Poland was as much a victim of Nazi Germany as any one else. And yes, I visited the memorial/museum – but my thoughts were very much on what happened in those places when they were extermination camps.